NEW LEXUS/TOYOTA V8 FORUMS HERE! LEXUS DIECAST MODELS CARS HERE! (You'll find "LEXUS" on the left side. Check it out! Most of the Lexus owners really neglect this simple maintenance and this can cause some gas mileage lost. 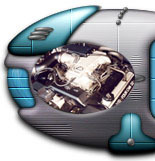 PCV stands for Positive Crankcase Ventilation. Basically the crank pressure is vented out via the driver side valve cover. The ventilation contents contain air and oil vapors. From the stock system, the crankcase ventilation is routed back into the upper intake. As time goes by and oil residue developed, the PCV valve doesn't open or close properly and this may lead to engine damage especially when the backfire. The picture below demonstrate the location of the PCV valve. The pcv system is especially important when 1uzfe is being force induced such as supercharge or turbo. Where does the crankcase pressure comes from? The are few avenues this is created. The first is obvious from the intake portion of the throttle body on the passenger side. Second would be the residual pressure from the oil pump and third would be engine heat. The pictures below are techniques how to take out the pcv. If you plan to reuse it, make sure you use a towel and wrap around it and use a plier to pull it out. This process will take little muscle. After you take out the pcv valve, you should also consider changing the o-ring. Aged o-ring would leak and its best time to change both at the same time. The last picture is a used and aged o-ring. Be careful when taking out the o-ring make sure you don't break it and pieces of the o-ring fall into the valve cover. Best is to use two pliers and slow pull it out. The pictures below are two pcv valves. On the left is a brand new pcv from a local Lexus dealer and on the right is a used with residues build up. On the far right picture below is a engine degreaser. You need a degreaser and a compressor. Spray the degreaser on both side of the pcv and shake it few times. A compressor would be very helpful at this time. Blow out all the crankcase vent residues. Once its clean, the pcv is as good as new. However, you can also replace old pcv valve completely. Once the pcv is cleaned, you can now re-install it back along with the new o-ring. In the middle picture is the comparison of new and old o-ring. Use some WD-40 on the o-ring and it should slide right in. After that, you can insert the pcv valve into the o-ring. Now you can connect pcv tube back and you are all set to go. Below pictures are the normal function of pcv valve in a Lexus 1UZFE engine. Good luck and have fun. All content in this site is copy right by Lextreme.com. Please respect our hard work and don't copy texts or pictures from this site. However, links will be highly encouraged. If you feel our articles worth while, please feel free to donate to support our site. Thank you.